Carey Services – It’s Duck (Race) Season! The annual Carey Services Duck Race has become an early-summer tradition in Grant County, and in 2018 we will celebrate our 12th anniversary of having fun and raising money to help the individuals we serve. As has become tradition, the ducks will take their lap around the lazy river at The Splash House in Marion in late June; this year’s race will be June 23. The gates to the Marion Splash House will open at 11 a.m., and the race will begin about 11:45. We’ll have some traditional pre-race fun before the ducks splash into the water for their swim. 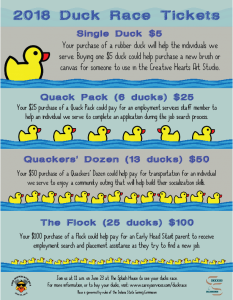 In the spirit of fun, we’re changing the way we are selling ducks this year. In addition to buying a single rubber duck for $5, you now will be able to buy packages, each of which include bonus ducks — which means more opportunities to win. 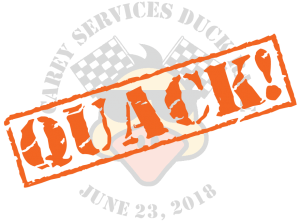 A Quack Pack is six ducks for $25; a Quackers’ Dozen — in honor of Carey Services’ mascot, Quackers — is 13 ducks for $50, and The Flock is 25 ducks for $100. We’re also offering more cash prizes this year; five lucky ducks will provide prizes of $1,000, $500, $300, $200, and $100 to their respective ticket holders. Several ducks also will be drawn for additional prizes after the cash-winning ducks are determined. Winners do not need to be present at the race to win prizes. We are seeking sponsors for the race, and for more information you can call April Scott at (765) 668-8961, ext. 111, or email her at ascott@careyservices.com. You can find the official rules for this year’s race here. Check back here often for more information as race day approaches.